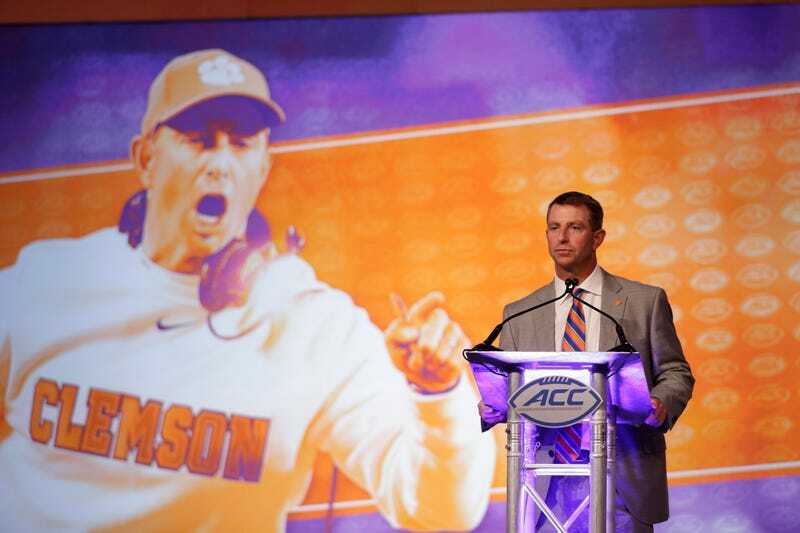 In an interview that manages to be equal parts expected and stunning, Dabo Swinney, head coach of the reigning national runner-up Clemson Tigers, has issued his Colin Kaepernick take, and it’s as beautiful as is it maddening. Swinney took time with Aaron Brenner of The Post-Courier and the rest of the media to discuss the recent protests led by Kaepernick, air his thoughts on how he believes Kaepernick should have gone about protesting, and let the nation know that, sure, things are bad, but at least we’ve got interracial churches and Obama—and for two terms, no less. Look, the contents of this interview aren’t going to be surprising: If you follow college football, even vaguely, you likely had an idea as soon as Kaepernick took a seat what Swinney’s takes were on the matter. What this more sharply highlights are the honest and misinformed thoughts of a white, self-made millionaire and football coach, thoughts shared by a large swath of people who do not hold the latter two titles. I highly encourage you to read the entire piece; if this is your first inkling that Swinney has takes on such matters, here are some of the highlights. “I hate to see what’s going on in our country. I really do. I think this is a good world. I think this is a great country. It’s just that things get painted with a broad brush in this world these days. When asked for his thoughts on the medium Kaepernick selected for his protest, Swinney suggested the 49ers quarterback should have taken better care to go about his protest in a peaceful and thoughtful manner. “I think the answer to our problems is exactly what they were for Martin Luther King when he changed the world. Love, peace, education, tolerance of others, Jesus,” Swinney said. “A lot of these things in this world were only a dream for Martin Luther King. Not a one-term, but a two-term African-American president. And this is a terrible country? There are interracial marriages. I go to a church that’s an interracial church. Those were only dreams for Martin Luther King. Black head coaches. Black quarterbacks. Quarterbacks at places like Georgia and Alabama and Clemson. For Martin Luther King, that was just a dream. Black CEOs, NBA owners, you name it. Unbelievable. Obama On Kaepernick: "Sometimes It&apos;s Messy, But It&apos;s The Way Democracy Works"
Roger Goodell On Colin Kaepernick: I Love The Troops!